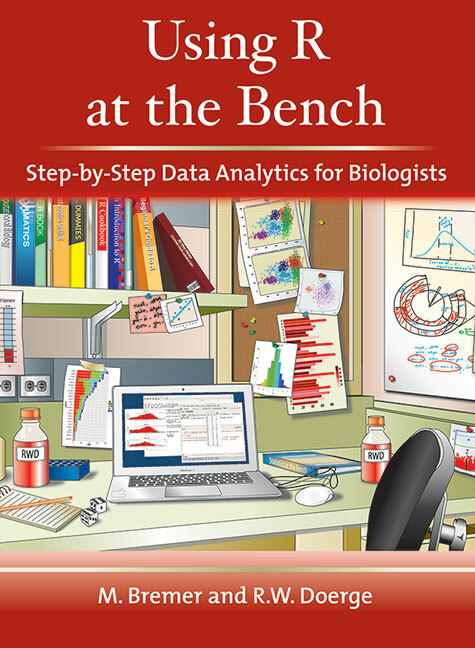 Using R at the Bench: Step-by-Step Data Analytics for Biologists is a convenient bench-side handbook for biologists, designed as a handy reference guide for elementary and intermediate statistical analyses using the free/public software package known as R. The expectations for biologists to have a more complete understanding of statistics are growing rapidly. New technologies and new areas of science, such as microarrays, next-generation sequencing, and proteomics, have dramatically increased the need for quantitative reasoning among biologists when designing experiments and interpreting results. Even the most routine informatics tools rely on statistical assumptions and methods that need to be appreciated if the scientific results are to be correct, understood, and exploited fully. Although the original Statistics at the Bench is still available for sale and has all examples in Excel, this new book uses the same text and examples in R. A new chapter introduces the basics of R: where to download, how to get started, and some basic commands and resources. There is also a new chapter that explains how to analyze next-generation sequencing data using R (specifically, RNA-Seq). R is powerful statistical software with many specialized packages for biological applications and Using R at the Bench: Step-by-Step Data Analytics for Biologists is an excellent resource for those biologists who want to learn R. This handbook for working scientists provides a simple refresher for those who have forgotten what they once knew and an overview for those wishing to use more quantitative reasoning in their research. Statistical methods, as well as guidelines for the interpretation of results, are explained using simple examples. Throughout the book, examples are accompanied by detailed R commands for easy reference. 7.1.6 Model Building in Regression: Which Variables to Use?